Since our last report we have been busy with Bible studies, personal ministry and interaction with the brethren here in Ethiopia. We finished our three day conference on Saturday, June 2nd and consider it a tremendous success in the Spirit. The messages covered the need for a living personal relationship with God, Ezekiel’s vision of the Soul, our progression with God through the tabernacle, its structure and the Body of Christ, Disorder versus Divine order in the Church and God’s Five Fold ministry. 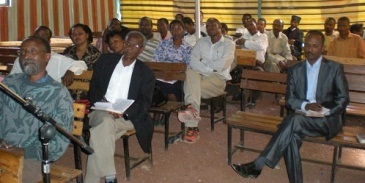 The meetings comprised of many church leaders with about 60 in attendance. We had very lively question and answer periods after several of the meetings. As a whole many were blessed with the word we were bringing. It was marvelous seeing many who were catching the vision of the Spirit for this time. It reminded us of our early days in this word when we were so hungry for the divine revelation that was given to us. The background of these brethren included Assembly of God, Mennonites, Messianic Jews, Independent ministers and former Coptic Christians. We met a priest from one of the main line religious organizations who was recently born again who had come to the meetings. Afterwards when we talked with him, he shared that he was ministering the Bible secretly to his fellow members of that organization. This brother is seeking the direction of the Lord and we believe that God will lead him according to Revelation 18:4. We have also met young people that meet secretly on campuses. We were informed that there is a law that forbids such gatherings outside of the officially recognized Coptic Orthodox church. They desire for the brethren to meet with them at some time. We believe many new doors have opened for the Kingdom of God. Br. Campbell had given Br. Burt a word when he came to Ethiopia that many doors would be opened. He encouraged Br. Burt to follow the Spirit of God as to which ones were ordained of God. The work needs much prayer and intercession for there is spiritual opposition on many fronts. From minor ones with the interruption of power and lack of basic necessities to severe health issues among the brethren. We see the hand of God move mightily in spite of all these things. One brother was in a coma and the day that we prayed for him he called us that evening while still in the hospital. Isn’t God marvelous? We would like to share one of our divine appointments. 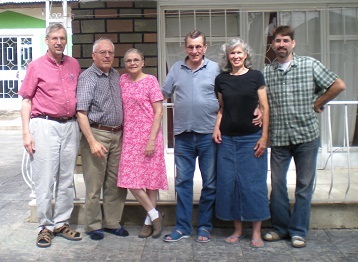 One evening when we were walking we met a Mennonite couple who after conversing for a few minutes invited us to their home for dinner. When we arrived that evening we entered into a blessed time of fellowship. The man inquired as to our reason for coming to Ethiopia. Our course of conversation centered on the coming of God’s Kingdom and the preparing of our temples for His coming. The Spirit of God was precious in our midst. We ended our evening with prayer and blessing their home. A prophetic word came forth to this couple which was readily received by them. Praise the Lord! The team is doing well here by the grace of God. Our daily time of praying has made an impact when we go out to minister. Barak Asbill had joined the present team on June 1st and was able to be with us for the last day of the conference. His being in the last meeting of the conference was the timing of God. He was able to share in the last meetings of the afternoon, and what he shared was a capsulation of the word that confirmed and explained that which had been shared previously, the same of which he had no knowledge. It was something that was orchestrated by the hand of God. He will continue to be here until June 15th. Mark and Rita Jantzi and I leave Ethiopia on June 5th. Burt and Nancy Asbill will complete their stay on June 26th. On Tuesday we meet with the printer to go over the final details of the printing of The Pattern in the native language of Amharic. We are hoping that this second printing of 1000 copies should be ready within a few weeks. Many of the brethren that were in attendance to the conference have signed up for The Pattern once it is published. We want to thank everyone for their prayers, fasting and continual support on behalf of this endeavor in Ethiopia. Please continue to pray for this nation and for those who are hearing the trumpet sound. In particular keep Br. Jemal and Br. Fikre and their families in your prayers. These are two faithful men that God has entrusted with this work. They and their families are very precious and very steadfast in the work of the Lord. Also, please pray for Sister Ruth Tadesse and her family. This Sister has faithfully labored tirelessly on behalf of her nation in intercessions, translations, finances and communication. May the Lord bless her mightily.